One obvious solution to the problem of sitting is to work standing up. But – as a new infographic (included below) from the Nursing Department at Georgetown University shows – standing carries its own risks, including low-back pain, leg and foot pain, flat feet (pronation), and plantar fasciitis, as well as more serious conditions like chronic venous insufficiency and stroke. These issues are well-known in the industrial, retail, and service sectors and are just now arising in the office as more desk workers stand up to work for all or part of the day. The Georgetown University Nursing infographic sets out several sensible action steps for both sitters and standers, recommending regular breaks to stretch and move, posture awareness check-ins, and comfortable footwear. They also suggest that sitters ask their employer for an adjustable-height desk to move between sitting and standing throughout the day and that standers consider saddle chairs and other active-seating options that let you adopt a posture midway between standing and sitting. 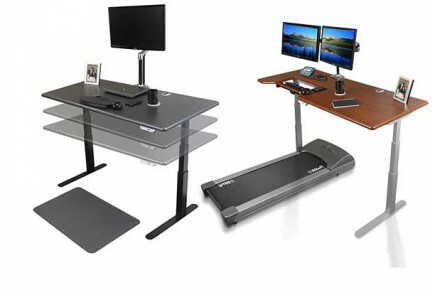 Here at WorkWhileWalking we are, of course, fans of the treadmill workstation, which addresses both the sedentary hazards of sitting and the stationary hazards of standing.